Gaming and technology website Shacknews.com has published Beneath a Starless Sky: Pillars of Eternity and the Infinity Engine Era of RPGs, an online book available to read for free on Shacknews. Written by author and Shacknews editor David L. Craddock, Beneath a Starless Sky is an exhaustive, narrative-style account of the history of Obsidian Entertainment and the making of Pillars of Eternity and Pillars of Eternity II: Deadfire. Other chapters explore the development and influence of classic roleplaying games such as Fallout, Baldur’s Gate, and Icewind Dale. Craddock wrote Beneath a Starless Sky based on months of research and over 40 hours of interviews with game developers from Black Isle Studios, Interplay Entertainment, BioWare, and Obsidian. “I grew up playing the RPGs that influenced Pillars of Eternity and Pillars of Eternity II: Deadfire, so getting the chance to talk with so many of the people who helped create them has made the past several months a dream job,” said Craddock. Alongside Beneath a Starless Sky, Shacknews is excited to announce the premiere of two brand-new video features: 24 ‘Til Launch, a documentary series that showcases developer interviews in the hours before a game’s release; and Shacknews Long Table, panel discussions between Shacknews editors and game developers. In the inaugural episode of 24 ‘Til Launch, Shacknews editors visit Obsidian one day before the release of Pillars of Eternity II: Deadfire. 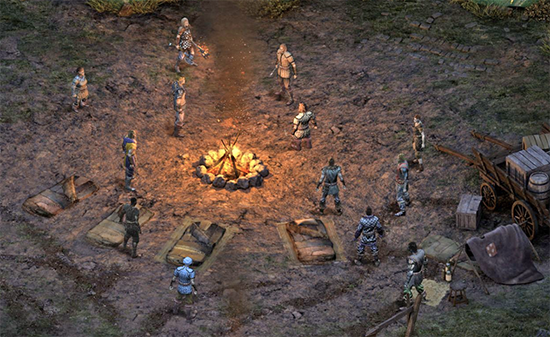 On Shacknews Long Table: Pillars of Eternity II and RPG Design at Obsidian Entertainment, seven of Obsidian’s developers talk the history and making of role playing games with David L. Craddock. Beneath a Starless Sky: Pillars of Eternity and the Infinity Engine Era of RPGs is available to read online for free alongside other long-form content such as Rocket Jump: Quake and the Golden Age of First-Person Shooters.